In the typical fashion that I usually write in, two things will happen here. First I will jump to the end right at the beginning, and two, the middle will probably have more detail than what you want. But if you venture through this short -on- words, big on photos story, I think you will see how easy a pro makes a very important project look. The first photos are the before and the after of what this really nice Wayne Dalton Garage Door did for our house. The flimsy, cheap door that was there served the function quite well, but it just did not have any Pizzazz to it. Probably a bad choice in words considering how many are available in the English language, but the look of a garage door has evolved. I think we are seeing the fading out of the typical white panel door and ushering in a new standard of the garage door opening being more of a designed statement. I really feel that Wayne Dalton nailed it with the 9400 Series. We were able to pick the panel design, the windows, the grids for the windows, the hardware and the best part… The color! The Mahogany finish looks great and does not disappear into the house. We have gotten a lot of comments from friends and neighbors that have said that they really like how it has classed up the look of the house and how the color and design of the door adds to the rest of the look. Yes, we have nice neighbors and if there are some that do not care for it… they should move far away. The TruChoice Color System from Wayne Dalton is a simple way to upgrade your home without paying an arm and leg. You can choose from more than 6,000 colors before installation! Sure beats painting your garage door after installation. I like it, and it is fun to come home to. Weird how a new garage door changes your perception about the house. It is the same house! But if feels different driving up. Hmmm. The Garage Door Store Boise.com did the install. Kevin and his guys are my Go-to’s” for anything garage door and Kevin had spent a lot of time fixing my old door. He was glad to see it go to the recycle center. Two hours start to finish and gone with the old, in with the new. It started with verification of all the new parts and panels, then removal of the old door and hardware. That took all of 15 minutes. The photo is a bit blurry because these guys wouldn’t stand still to get a picture taken! The new door is installed in sections with the bottom panel the first to load onto the new tracks. Then more panels to the top. Remember how I said they make this look easy? WORTH EVERY PENNY! I did this once for a friend and it took us 4 hours to get to this point! This new door has a bunch of insulation in it and I can tell you it is really quiet in the garage now; Not nearly as much street noise. I bet it is going to be a lot cooler in the summer as the sun pounds on this side of my house. The decorative hardware was installed, and some adjustments were made. The opener was hooked up and tuned and they gave the door several run throughs to make sure all was lined up and working right. We are really happy with the work and the new door. I have one more section of siding to replace on the front of the house in the spring and our exterior makeover will be complete. I would not have thought about how dramatic an effect a garage door can have as I tend to fall back on very conservative looks, but I am quite pleased with my leap out of my comfort zone and our choice of this Wayne Dalton 9400 Series Charleston Garage door. It is nice to know we are no longer just stuck with a few styles and even fewer colors. The factory applied finish on this door is beautiful and adds significant value to the curb appeal of the house. 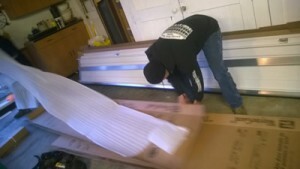 My thanks to all those at Wayne Dalton who made this door, and Garage Door Store Boise.com that installed it. Nice Job!